In association with the Joe Deluca & Linda Gronlund Freedom Majors, Track Night in Ameirca will take place on Friday, May 26. Pocono Raceway is one of the most historic circuits on the Track Night in America schedule having hosted NASCAR and IndyCar races for more than 40 years. In addition to the oval known as the “Tricky Triangle,” Pocono raceway includes a selection of road courses, the longest of which takes advantage of the ovals’ 3000+ foot straights to create a 2.5-mile 8-turn layout. Located in the mountains of Pennsylvania, the track is a two hour drive from both New York City and Philadelphia, making it a great location for an evening at the track. Prior to the start of this event SCCA will be hosting the new SCCA Starting Line Track School. The SCCA Starting Line Track School will help you get a leg up on your Track Night experience by adding extra educational elements and professional instructors in a car-control type clinic. Like other Starting Line schools – you will receive an SCCA membership, an entry to that day’s Track Night event, subscriptions to SportsCar and Grassroots Motorsports Magazines and an option for a motorsports-approved helmet. At the 2017 SCCA Convention the Northern New Jersey Region was presented with the Regional Road Rally Achievement Award. In 2016 our Region had the greatest growth of any region in the nation. Year to Year growith in number of events and total participation in our events was 250%. Congratulations to Peter Schneider and the NNJR Rally Team. Raymond the Cat returns to Pocono! Test day on Friday, racing begins on Saturday and concludes on Sunday with Majors races on both days. Garages are available for $100 for the weekend on a first come/first served basis. Each garage will hold two small cars! In addition, there will be an International FV Challenge Series on Sunday. They will have a qualifying session in the morning and a points race in the afternoon for their series Championship. Volunteer Party Friday Night and a Participant's/Driver's Party (open to all) on Saturday night with a live band. U.S. Majors Tour is the pinnacle of championship racing in North America. A common field one day. A field of honor forever. 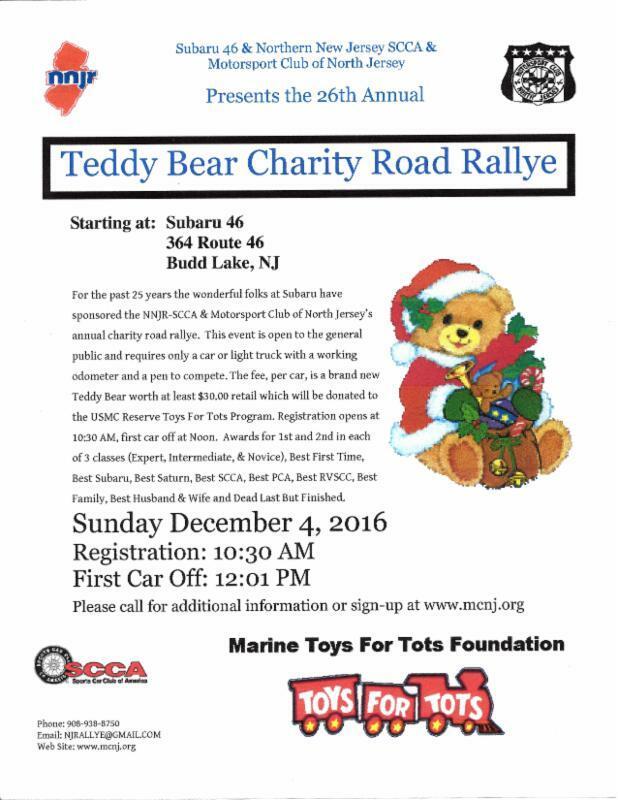 December 4, 2016 marked the twenty-sixth annual ‘Toys for Tots’ Teddy Bear Road Rallye, hosted by Northern New Jersey Region of the SCCA and Motorsport Club of North Jersey. This year’s sponsor and the sponsor for the past four years was Subaru 46 of Budd Lake, New Jersey. The NNNJR/MCNJ ‘Toys for Tots’ Teddy Bear Rally is the longest running charity rally associated with SCCA and the longest contiguous event organized by Northern New Jersey Region SCCA. Since 1990 we have collected over 3,100 toys and hope to continue the event for many years to come. This event is a very simple road rally using the back roads of Morris, Warren and Hunterdon Counties. The event started at SUBARU 46 in Budd Lake on Sunday December 4 and ended about 68 miles later at the Long Valley Brew Pub at the intersection of Route 517 and Route 513/24 in the center of Long Valley, NJ. The Daytona 24 Hour Race with be aired for your viewing pleasure! guests to throw off the chill of winter. Great food and drink provided. Thrilling race, rally and solo adventures. Racing Simulator again this year. NNJR bragging rights, and awards in several classes! Come out and test your skill at the NNJR Region Party. Join us for the NNJR SCCA Annual November Election Dinner on Tuesday November 15th! If you can't make it to the dinner no problem! Please join us for the Region Meeting at 8pm! The menu includes a three course dinner and cash bar in a private room at a cost of $35 per person. The 2016 NEDiv MiniCon will be hosted by Northern New Jersey Region. The dates are November 11-13, 2016, at the Wyndham Hamilton Park Hotel & Conference Center. The address is 175 Park Avenue, Florham Park, NJ 07081. Do you want to see how SCCA works? Come join the fun and attend. Contact your NNJR Board of Trustees to volunteer. Show the NNJR spirit! All of the candidates have stated their willingness to serve in the office for which they have been nominated. Any eligible members, not so nominated, who wish to have their name appear on the ballot for the election at the Annual Meeting shall submit a written notice and supporting petition. A candidate must have been a member of SCCA, Inc. for at least two (2) years. A candidate may run for only one office at any one election. Candidates may be bracketed in slates if they so desire. All candidates shall have equal access to the means and equipment available to the Region for campaigning but no funds or supplies of the Region shall be used for campaigning. In 2016, NNJR has decided to step-up it’s road rally program in association with the Motorsports Club of North Jersey and Raritan Valley Sports Car Club. As you may know over the past 26 years NNJR has been hosting the longest running charity event with the annual US Marines Corps Toys for Tots Gimmick/GTA rally. In addition they have hosted a dozen or so Pine Barrens Express events, which was an evening TSD rally in the New Jersey Pine Barrens, great sand roads with mileage to each instructions and closed controls. A zero hero event, if you understand tire slippage in ‘sugar’ sand and water holes. This year NNJR is hosting five events all of them Gimmick/GTA road rallies. These events are based on the same principle as the Toys for Tot rally. 25 points for each incorrect answer to a question and 100 points for each mile over or under the official rally route. The questions are mostly used to determine your knowledge of the General Instruction or to provide additional penalty points for off-course loops. The July event (Rallymaster Michael & Pepi Brooks), was held of July 24th, started out with a standard Odometer leg, followed by six legs containing five route following traps. The traps included a ‘Straight as Possible’, ‘Onto’. Hard to see signs and being able understand the difference between a quoted road sign and the actual road itself (Turn Right after “AIRPORT ROAD”). Using an expanded mailing list (a combination of three local clubs and the SCCA mailing list of three regions) and Facebook ads, there was 28 teams participating in the event. Fifteen Novice teams of which twelve claimed to be first timers to the sport, which provided them with a $10 discount to the $30 entry fee. A record-breaking 171 drivers participated in the first NNJR SCCA autocross of the 2016 season, besting the previous record of 162. Each driver got FIVE! runs, and it was all finished in under six hours. We’d like to thank everyone for their hard work in making the event run smoothly and quickly. Heat one began with temperatures in the mid 40s, but sunny skies quickly warmed things up. In C Street, Keith Scala led the class in his 2009 Mazda RX-8 after first runs. Scala maintained his lead, and put down a 45.750 on his fourth run for the class win. Steven Berrodin and Tamra Hunt rounded out the podium. E Street saw an intense battle between Nick Babin in his 2003 Toyota MR-S and Serafin Tinapunan in his 1999 Mazda Miata. Both struggled to stay clean on first and second runs, but Babin grabbed the lead on his third run and stayed there. His 48.373 was the fastest in class by nearly half a second. Tinapunan held onto second place, and Nicholas Rivadeneira took third. In CAM-T Jeffrey Darbig (1983 Ford Mustang GT) and Christopher Collucci (1988 Pontiac Firebird) went back and forth between positions one and tow. Darbig’s 47.948 on run three was good for the win, with Collucci only 0.028 behind. In heat two the competition grew fiercer as the temperature continued to rise. A Street action was intense, with less than one second between the top five drivers. Yun Ng (2008 Honda S2000 CR), Chris Drabouski (2015 Porsche Cayman), and Cy Lee (2004 Chevrolet Corvette Z06) all traded places at the top of the list throughout the first four runs. On his fifth run Justin Lau (2006 Chevrolet Corvette Z06) cleaned up his act and put down a 45.649 to win the class. G Street also saw close action, with less than a second between the drivers on the podium. Jeff Taylor led the class in his 2013 Volkswagen GTI for three runs. On his fourth run, Joseph Lagdao (2015 Ford Focus ST) moved into the lead by over 0.7 seconds, and held on for the win with a 48.017 as both Taylor and Fred Kratzel (2013 Ford Focus) found time and dropped into the 48s. Heat three competition was dominated by the Pro class, with less than two seconds between the top 15 drivers. It was a Porsche-filled podium, and the top six drivers were all driving Super Street cars (one on Hoosiers). Pat Salerno and Brian Conners took the one-two finish in Conners’s 2011 Porsche GT3. Perry Aidelbaum (2015 Porsche GT4) was only a tenth behind and took the third podium spot. These three also took top PAX. As temperatures plateaued in the mid 50s the drivers of heat four enjoyed the day’s peak grip. Street Touring action was some of the day’s best. In STS it was battle of the co-drivers, with Mike Kobialka and Michael Roleira piloting their Mayhem Miata. Roleira led after first runs and held onto that lead for the entire heat, winning with a 45.697. Kobialka made him work for it, though, finishing only 0.059 seconds behind. Maciek Samsel (1997 Mazda Miata) took third. In STX it was Ken Houseal (2013 Subaru BRZ) with a 45.945 over Jose Tatad (2013 Subaru BRZ) by 0.279. STR was exciting as usual, with the only a second between podium finishers. Tim Kong (2008 Honda S2000 CR) took the win with a 43.895 on his fourth run. Josh Lipman (2008 Honda S2000 CR) was only 0.148 behind, and Hezron Laluces (2005 Honda S2000) took third. Michael Mitchell (1998 BMW M3) was the fastest Novice, with a 47.664. The day’s fastest run was a 42.191 by Evan Schickel (2010 Chevrolet Corvette Grand Sport). NNJR Swag now available at all NNJR Region Social Events! FREE and open to all NNJR members! Kick off to the 2016 racing season! Wyndham Hamilton Conference Center in Florham Park, NJ. It's that time again for the NNJR SCCA Region Party.This year we are doing something new - the 2016 Region Party will be kicking off the 2016 racing season instead of wrapping up the old one.The Region Party will be held at the Wyndham Hamilton Park Conference Center at 175 Park Avenue, Florham Park, NJ 07932 on Sunday April 17th from 3-6pm.The menu will include an Antipasto Bar, A Pasta Station and a variety of Hot and Cold Hors D'oeuvres with a cash bar.We will be handing out awards, selling our new NNJR T-shirts and hats and enjoying each others company.Looking forward to seeing everyone on the 17th! The menu includes a three course dinner and cash bar in a private room at a cost of $35 per person. or by text to Linda at 973.615.1398. Registration and “Rally 101” at 10:30 a.m. Rally begins at 11 a.m.
For the past 24 years the wonderful folks at Subaru have sponsored the NNJR-SCCA & Motorsport Club of North Jersey’s annual charity road rallye. This event is open to the general public and requires only a car or light truck with a working odometer and a pen to compete. The fee, per car, is a brand new Teddy Bear worth at least $30.00 retail which will be donated to the USMC Reserve Toys For Tots Program. Registration opens at 10:30 AM, first car off at Noon. Awards for 1st and 2nd in each of 3 classes (Expert, Intermediate, & Novice), Best First Time, Best Subaru, Best Saturn, Best SCCA, Best PCA, Best RVSCC, Best Family, Best Husband & Wife and Dead Last But Finished. The Annual Northern New Jersey Region Party! 2014 - NNJR Region Party! Get involved wth your club! Towne Hyundai paces the race at Pocono! Photos of the new Pocono road course! Fidelity Power Systems named as title sponsor of the Pro IT Series! Head and Neck Restraints Mandatory! 2018 - NNJR Region Party! 2017 - NNJR's Heidi Ellison is one 'quick chick"